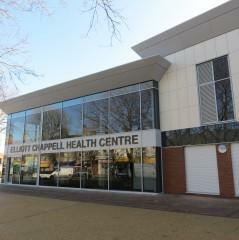 The £11m Elliott Chappell Health Centre is a new health centre developed on behalf of the NHS Hull. The new building provides better quality facilities for GPs and the community. The centre also houses a Lloyds Pharmacy and a range of community and voluntary services. 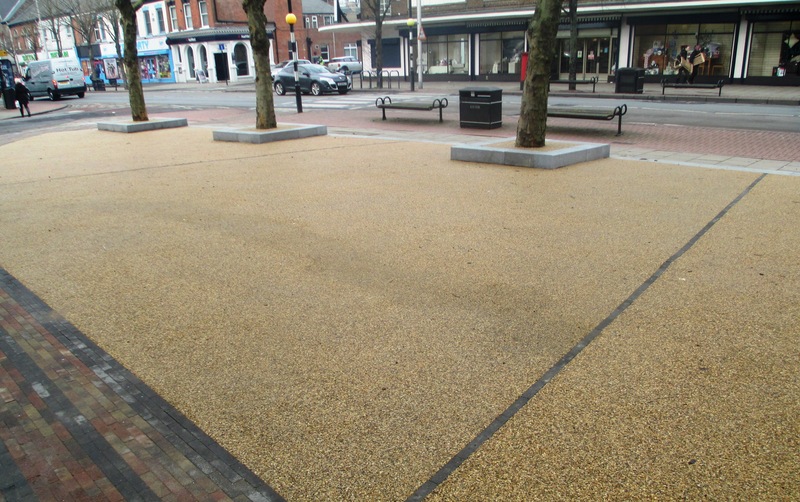 RonaDeck Resin Bound Surfacing was laid to a 700m2 area directly in front of the building to make an attractive public space. Seating was added to make the area more welcoming and to create a focal point. HLM Architects specified a Golden Harvest aggregate blend which gives a warm appearance to the health centre entrance. The contractors mixed the two-part resin with a drill and paddle and then mixed it with the aggregate in a forced action mixer prior to the surfacing being trowel applied to the macadam base. The surfacing was ready for foot traffic after just four hours. Established trees growing around the property were retained and protected with raised beds containing RonaDeck Tree Pit System on loose aggregate. The porous SuDS compliant system allows water to penetrate to the trees’ root system aiding the health of the tree. The tree pit surface can be easily swept clean, creating a pleasant environment and a feeling of well-being for members of the community visiting the health centre. Ronacrete Approved Contractor Route One Highways laid over 200 square metres of RonaDeck Tree Pit System at Beverley and Tollesby School, Middlesbrough. The landscaping work was part of a large new school building project combining two special schools in the area which provide education for students with autism and behavioural needs. The new trees planted at the school are relatively small, but will grow and develop over the years and will provide pupils of the future with a green pleasant environment in which to learn. The RonaDeck Tree Pit System protects the trees from damage without inhibiting their growth. The tree pit system surrounds the tree in a solid but porous construction which allows the passage of water to the tree roots and keeps the tree nourished and healthy. Ideal for use in public areas such as school playgrounds, streets, car parks and other areas where tree are enclosed by hard landscaping, it is easy to keep clean and so prevents the build up of hazardous and unsightly litter which often accumulates in tree pits, particularly the recesses of metal grilles. London is and always has been a tree lined city. Some of the benefits are obvious, trees are beautiful to look at – marking the seasons with blossom, seeds and changing leaf colours, they provide homes to a variety of wildlife and on a more practical level create shade and shelter. Trees have invisible benefits too; absorbing carbon dioxide from the atmosphere as part of the photosynthesis process which allows them to grow. This removal of CO2 from the atmosphere trees can reduce the effects of pollution by cleaning the air and reducing temperatures. Large leaf canopies catch rainfall and slow down the water’s progress from sky to the ground, helping to reduce flash flooding. Trees also release oxygen into the atmosphere and their leaves catch dust and pollutants in the air preventing them from spreading further, they reduce smog formation, radiant energy from the sun is absorbed or deflected by leaves, this combination of factors reduces the incidence of asthma, skin cancer and stress-related illness. Trees can even reduce crime! The presence of trees creates a more pleasant environment that people want to go out and enjoy. Simply having more people around to potentially discover and report crime and this deters criminal activity. Many London Boroughs have embraced the need to preserve existing trees, replace diseased and dead trees and plant new trees, but planting and maintaining trees in an urban environment is not without problems. A tree’s root system obviously needs access to water in order for the tree to survive, the roots also need to be able to move as they grow. However a natural earth setting is not possible in a pedestrianised street as it can get very muddy, slippery and be hard to keep leaf and litter free and trees are at risk of root damage or being uprooted entirely. Traditional tree grilles provide irrigation and protection for the tree roots but they are difficult to keep clean as litter, dog waste, cigarette stubs and even hypodermic needles get deposited or trapped between the bars. 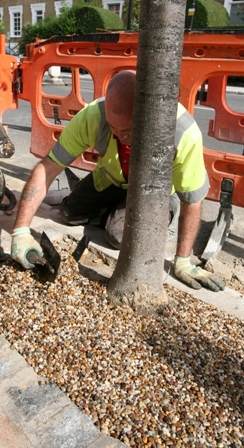 The London Borough of Hackney asked Civil Engineering Contractor Volker Fitzpatrick to solve the problem of protecting the roots of the many trees which enhance the streets of Hackney, situated on the doorstep of the Olympic site. 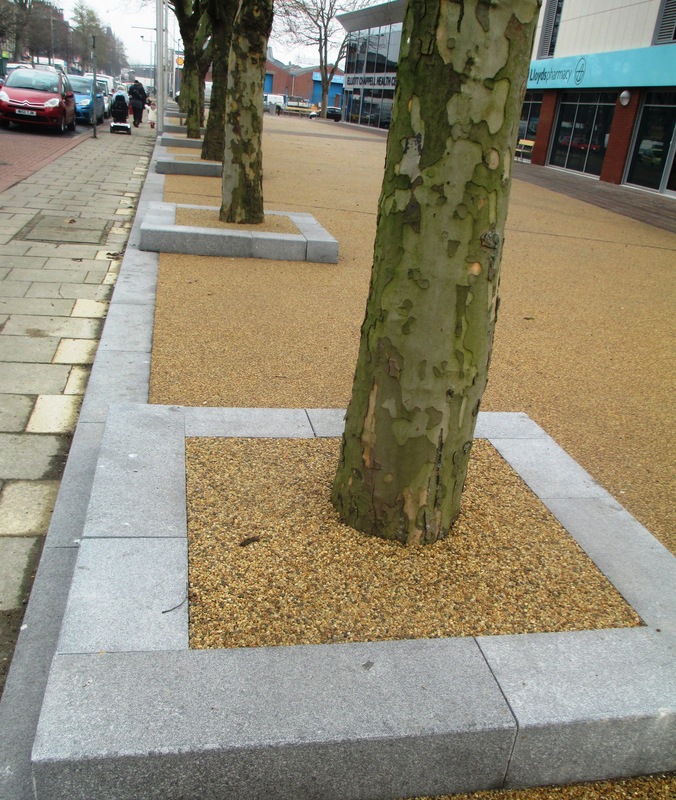 RonaDeck Tree Pit System from Ronacrete was recommended for its SuDS compliance, ease of maintenance, flexibility and for the appearance of the resin bound gravel. 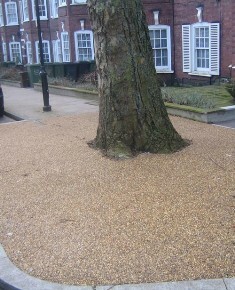 RonaDeck Tree Pit System is a natural aggregate finish surround for planted trees in public and private areas. RonaDeck Tree Pit System surrounds the tree in a solid yet flexible construction that is easily swept clean and has a porous structure that allows rainwater to seep immediately through to the root system and reduces the burden on surface water drainage. Sub contractor AJ O’Connor purchased the RonaDeck Tree Pit System through specialist construction industry distributor WT Burdens and gradually the system has been applied over a large area. AJ O’Connor excavated around each tree to a depth of 150-200mm and filled the excavation with gravel to within 50 mm – 75 mm of the surface, the required depth of RonaDeck Tree Pit System, depending on expected traffic. The two-part resin was mixed with a drill and paddle before being added to the kiln-dried aggregate component in a high capacity forced action mixer. The mixture was then laid on the prepared gravel base and levelled off; allowing a curing time of four hours for foot traffic and one day for vehicles.